Conveniently located in the Berlin Mall, JuiceBox is Vermont's premier raw juice and food bar. Native Vermonters Kara and Ian Bouchett believe in a better juice. 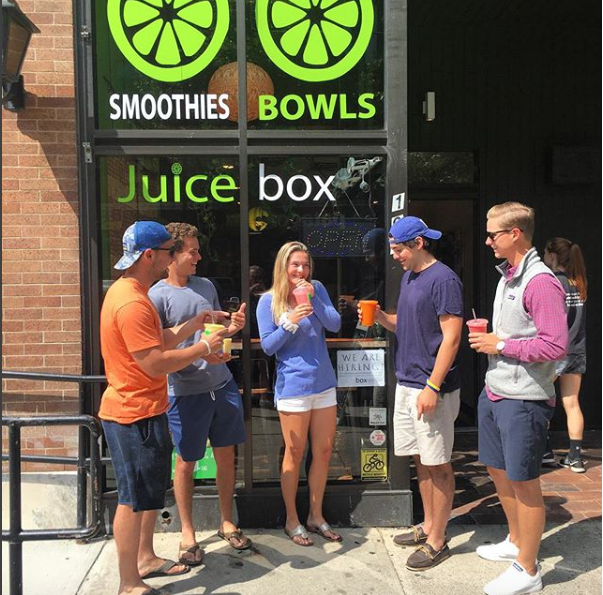 Years of juicing fruits and vegetables from their own garden and simmering the desire to show others its nutritional power led the Bouchetts to proudly open Juicebox in 2013. Since then, Juicebox has remained the one-stop shop for the freshest, made-to-order juice and raw food products. The Juicebox menu continues to expand with nourishing and delicious choices. Kara, the in-house raw food nutritionist, designs every item on the menu with love and creativity, and Ian expertly sources and procures every ingredient to ensure the freshest raw food experience customized to you and your taste buds. No preserved juices. No brand-name granola bars. No artificial sweeteners. Just natural food to nourish you inside and out. JUICES - Fresh and Made to Order! Don't see what you like? Just ask! A tasty blend of figs, oats, nuts, and more! Made fresh! Fresh new energy bite combos weekly prepared by our in-house raw chef! fresh and frozen fruit whipped to creamy perfection topped with dried fruit and vegan treats. Superfood Boosts – Add ons to your juice, bowl or smoothie to boost nutrition and add exotic flavors and textures. Fresh Smoothie Bowls Made to Order! Nothing beats the taste and nutrition packed into one of our fresh smoothie bowls. Textured like a hybrid between ice cream and a smoothie, this dairy-free treat is will give you a blast of energy and flavor, with fresh, frozen and dried fruit! Enjoy our standard toppings or pick from our seasonal topping list! Join us every day for unique and tasty clean eats prepared by our in house raw chef. A variety of salads, snacks, and bites offered each day. Burlington's favorite stop for freshness, health, and joy. Are you nervous about which raw juices to try? Do their wild colors intimidate you? Are you suffering from an illness or other physical ailment? Have you thought about starting a personalized juice cleanse? You're not alone. JuiceBox offers nutritional counseling uniquely tailored to your interests, diet, and physical health needs. The in-house certified nutritionist will give you a tour of the raw food world, create a menu that meets your nutritional desires, and guide you along the way to exploring how fresh juice and vegan foods can change your life. Every body is different and every body needs its own juice. Contact Us through the form below for more information, or to schedule a fresh juice cleanse! Stop by the shop, give us a call, or fill out this form with any questions or comments you have, or just to say hello. Thank you for submitting our contact form!